The high level segment of climate negotiations, bringing ministers and heads of states, has started. At the official opening head of the Russian delegation, Head of Roshydromet, A.Frolov and the President’s advisor on climate change, A.Bedritsky, were presented. NGO observers from Russia and Ukraine directed an appeal to the delegates to allow JI only to those countries who sign KP2. Russia suggests to vote at the COP on the correction of the Artickle 4 of the Convention concerning revision of lists of developed and developing countries. But their is still o sufficient movement both to KP-2 and to the new legally binding agreement. 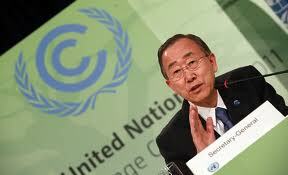 The high level segment of climate negotiations, bringing ministers and heads of states, has started. At the official opening head of the Russian delegation, Head of Roshydromet, A.Frolov and the President’s advisor on climate change, A.Bedritsky, were present. The complete list of Russian delegation members may be viewed here. It is notable, that there are 2 Rosatom representatives among them. Even if the nuclear issue as a way to fight climate change has not been addressed yet, Russia has seemingly decided to back its position on it well, just in case. At the plenary sessions which will last from Dec 6 til Dec 8 representatives of all countries, groups of countries and international organizations working on the UNFCCC implementation will have floor. At the first opening session on Dec 6, UN Secretary General Ban Ki-Moon said that the decisions are hard to make during the first week, but here it is very important to keep on pedaling, like on a bicycle, in order not to fall. His opinion is that we have already passé the point of no return in reaching the global goal of keeping the warming below 2 degrees and we need to back off from the abyss. Many speakers called for the implementation of Cancun Agreements, for the definition of adaptation limits and for the identification of the most vulnerable countries. There was talk about the need to progress on short- and long-term financing mechanisms. Long-term financi8ng must imply hundreds of billions of dollars by 2020. The developed countries were again called upon to be the first ones to contribute to it, so that the fund could start operating. 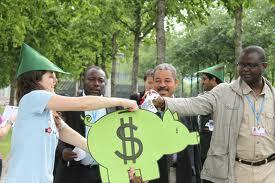 On the same day NGO observers held an action to push for the countries to contribute finances to the Green fund. As for the future of KP, Ban Ki-Moon said that it is the maximum that we have right now and it is a base for future agreements, thus Kyoto-2 is more than necessary. Russian and Ukrainian delegates prepared an appeal to official delegations concerning Kyoto-2, JI and hot air carry-over. The appeal was given to the participants of a closed meeting on JI by representatives of RSEU Climate Secretariat and a Ukrainian NGO. A few days of informal consultations on Russia’s proposal concerning Article 4 of the Convention about the regular revision of Annex 1 countries did not end up with a consensus. Many countries benefit from being on the list of developing countries and avoid becoming donors while still receiving aid for low-carbon development and adaptation. Apart from that, this issue implies a huge amount of work on defining methodology and criteria of the development level of countries, revision procedures development etc. Among those most actively “in doubt” today there were India, China and Zimbabwe. They proposed moving this discussion to COP18 in Qatar next year. Arab oil producing countries did not take part in today’s consultations. Russia’s representative, Oleg Shamanov, suggested a voting procedure on this issue by the COP. This may take place if there is no consensus, and then the decision may be taken by ¾ of the votes by Parties. If this kind of proposal is adopted, then in a few years Russia will have to decide on its own status by itself. Will we remain an economy in transition trying to stay addicted to the oil and gas needle as long as possible or will we move towards where developed countries are, to those having not only political leadership ambitions, but actively moving away from carbon dependency and a real (and definitely not declarative) green energy development.